Avantree’s mission statement is: “To provide simply convenient lifestyle mobile accessories to the market.” So they have mostly Bluetooth accessories, especially for audio reproduction. In our article, we concentrate to Avantree ANC032. The Avantree Active Noise Cancelling (ANC) Bluetooth 4.1 Headphones are quality and awesomeness on every level. Sound. Design. You name it. If you’re looking for an economical, lightweight, Bluetooth headphones that fit nicely over the ear then you should definitely consider the Avantree Noise Cancelling Headphone. At $50 or so you can’t go wrong. In fact, the headphone is a lot for the money. If you value the convenience of a Bluetooth, comfort, reliability, and durability, these headsets are your best bet. Comfortable headphones that are also affordable. You can use these headphones while moving around the house or on the go, or while sitting at your desk or couch. Overall, it fits really well. It’s built with people with a largish head and ears in mind because it’s still able to fit and truly cover the ear, not partially, unlike other headphones. Also, it’s very comfortable, no headaches! The Avantree Noise Canceling Headphone is light and it doesn’t really clamp down on the head that hard. The packaging looked sturdy and very professional too. Or if the 16-hour claim of the manufacturer is anything to go by, meaning the headset is staying up and strong, so that you can enjoy nice sounds for a considerable period of time. Switching from device to device is very easy. The range is not bad either. Charges really fast (in about 2 hours for a 10+ hours of useful life outside the plug) and save battery life. This device has several metal parts at the joints making it apparently durable. It does also come with a flat red 3.5mm headphone cable to use instead if you want. AUX cable is included for wired use if the battery dies. The Avantree Active Noise Canceling Bluetooth Headphone is a very nice over-the-ear headset that is reasonably light. But that’s not all. ANC offers an improved and fully customizable fit with swiveling ear cups, an adjustable fold-able headband, and super soft ear pads. Setup is a breeze plus you can easily connect it with other devices. Like your transmitter. Battery life and standby time are good. And as mentioned earlier, the fit and finish of the Avantree Active Noise Canceling Bluetooth 4.1 Headphones are, well, nice. The sound is good and not too heavy. Engineered with high precision 40mm (1.57 inch) stereo drivers combined with an advanced Bluetooth CSR chipset, this device delivers powerful and steady audio. Sound quality is unique, compared to other similar headphones. Mid-range and lows are crisp & clear, with a deeper bass well suited to those who prefer to watch TV, or modern music like hip-hop. However, if you want to listen to classical music, you’d be better off with other headphones. 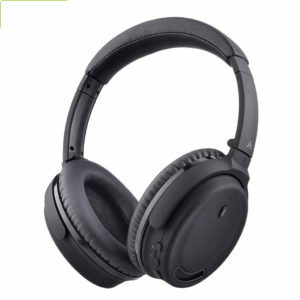 Avantree Noise Canceling Headset can be used wired or wireless. A weight of 0.40lb (180g) makes this device super lightweight. Listening to some prime music at work and you wandered a distance from your desk to the water cooler and restroom, for instance? Your connection will be maintained still. It’s fully and readily compatible with any Fast Stream low-latency Bluetooth transmitter (Avantree Audikast or Priva III). It’s portable: it can be folded or made to lay flat. Pairing the headset with any Bluetooth device, including tablet, phone, and laptop (with or without Bluetooth) can’t any get easier. But regardless of whether this device is paired with a phone, a computer, your laptop or a transmitter, ANC works wonderfully well. Anti inconsistent/sudden boost of noise. The band that goes on top of your head doesn’t have any padding like most of this type, however, you can purchase an aftermarket version of this to add to them if you need.